Research by Devesh Kumar Interview with Vivek Currently Studying and Menon. 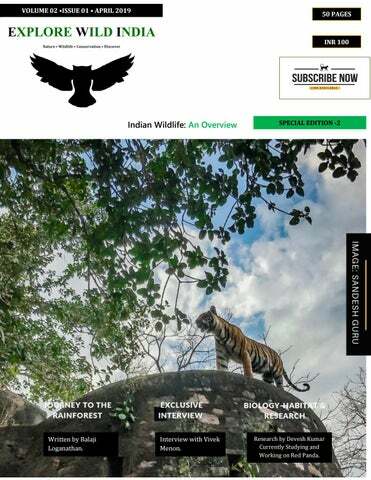 EXPLORE WILDWorking INDIA │ MARCH 2019 on Red Panda. ADVERTISEMENT ISSUED BY EWI-APP INDIA KAILASH COLONY NEW DELHI 110065. Akshita Jain is currently doing her B.tech from IIT Guwahati. She loves to capture wildlife and macro and is a self taught photographer. Akshita has been to various forests including Kanha, Pench, Satpura and Pobitora. She along with her family adopts a wild animal each year and has so far cherished 10 animals including a white tiger, a leopard, two pythons, and a sloth bear as a part of her family. Akshita wishes to work for wildlife conservation and become an Indian forest service officer in future. Arvind Karthik B Nature and Wildlife Photographer- His photos have been chosen as Best of Wild India. Arvind has been involved in various wildlife conservation activities across Karnataka. His love for Big Cats has been surreal with his popular tag line "The Future of Wildlife is in our handsâ&#x20AC;?. Image // By RAVINDRA SINGH DAHIYA These animals bring us a powerful message. "These are the creatures of the forest and may their forests remain wild forever." Man-Animal Conflict is rising in India and as a result a lot of Tigers died in 2018. But there's infinite hope when you look into their eyes, a hope for Survival. T-19 Krishna's Cub photographed early morning in Zone-4 of Ranthambore National Park after too many failed attempts of tracking them. We tracked them in Aadi Daant area and then at Aadi Daant but all we found were pugmarks. Mother and cubs were there in Nullah but not visible from the Lambi Top. As we peered down in the Nullah we found all the 3 cubs sitting in the thicket. 48.Online Discussion – Aarzoo Khurana Image: Peacock. Now in this Edition I want to show the beauty of Wild India - how India has varieties of birds & animals. I have tried my best to put needed information about species and their habitat distribution in this issue. In this Edition Photos are mostly featured from Himalayas, Bharatpur, SGNP and Cotigao WS etc. Time has now come to save these beautiful creatures and also need protection to save them”. I love leopards in comparison to other animals. I love them more in comparison to tigers and Asiatic lions. I read Kenneth Anderson books “Tales from the Indian Jungle” is one of them. Leopards are killed by people presently more due to human – animal conflicts. We have to work together to save these adorable species like we are doing for Tigers and Asiatic lions. Every Species plays its part to maintain ecological balance. Due to deforestation and movement of people to their habitat, they are badly affected. Leopards are the pride of our nation. Their habitats are shrinking day by day due to movement of people into forests or jungles. Remember Rudyard Kipling mentioned black leopard Bagheera in the jungle of Seoni Madhya Pradesh in his famous novel “The Jungle Book” but now if you want to see black leopards you have to visit Kabini, you can see them in Tadoba too. Even scientists have found black leopard in Pakke Tiger Reserve in Arunachal Pradesh. They are truly the pride of our Country. They really remind us the beautiful Wildlife of India. India is a beautiful country rich in flora and fauna. You can see Snow Leopards in Ladakh and also in Spiti valley of Himachal Pradesh. I did not want to write article’s name “The Last Leopards of India” but due to their continuous habitat ‘s destruction we may lose them one day that’s why we have to work for conservation of them, So our future generation can see them with their naked eyes and do research on them like we are doing . It’s a voice of leopards from all over Indian jungles to save them. I highlight some major issues in this article to save them we have to keep stories of Kenneth Anderson - alive forever in our jungles. Early in the morning with the chirping of birds around 7:30am, me and my uncle were wandering in forest in a car along the road and we just saw a peafowls but they disappeared as they realised that we were there. After some time when we were in the middle of some trees, some distance away from that site we heard their calling and we stopped. Got ourselves out of the car and we saw that a those beautiful peafowls were crossing a road so carefully as if they need to reach somewhere on time. LOCATION: OUTSKIRTS OF CHANDRAPUR, MAHARASHTRA MAMLA FOREST RESERVE MUL ROAD. PHOTO : SWARNIL KOKULWAR / / EXPLORE WILD INDIA APP . Image : Balaji Loganathan Daring into a dense jungle in the middle of the night, where creepy venomous Malabar Pit viper’s & other native snakes rules the rain forest . While we started walking the forest trail at night as the dark thunder clouds wrapped the whole sky covering the moon ; On our trails were full of busy frogs crocking everywhere, Bombay bush frog in his usual call (similar to of a busy typewriter typing) & Wrinkled frog to blowing continuous short whistles to call out there mates!. With a slight drizzle & gentle breeze uplift the whole scene at that night revealed the beautiful hill station called Amboli; situated in high altitude of Maharashtra region. The Night was fast falling & after walking few minutes later! while crossing the main smooth flowing stream we happened to witness the wrinkled frog protecting the eggs from their predators; with on & off play of rain shower`s we reached the spot & switched off our torch,soon our eyes started getting accustomed to the darkness in the forest.. In complete darkness slowly, we could see the magic in front of our eyes, finally a caecilian emerges from forest floor During Monsoon, these torrent rain drench the forest completely, which rise to a mysterious scape, only this time we were able to record this species, first time for this season Which is rarely reported only in few patches of western Ghats in India.. I`m really happy & blessed to witness this. A baby alexandrine parakeet tangled up to death in a deadly manjha used for kite flying festival in India. Fortunately with the help of fire fighters and local bird friends managed to save other chicks hanging from kites n threads over trees . Plight of many birds after the festival of kite flying in India . Although apart from the hooligans there are also many people working upright for rescuing and not neglecting these life forms . My salute and highest respect for those who choose birds over kites and showed that kindness is a choice and we can't stake lives for our fun . Take a bow all the bird rescue and helping folks . God bless . Wildlife Conservation Trust is an Environmental Conservation Organization are Working across 130 Protected Areas and 82 % of 50 Tiger Reserves in India Protecting Wildlife and Reviving Communities. Wildlife Conservation Trust 11th Floor, Mafatlal Center, Nariman Point Mumbai Maharashtra India 400021. Advertisement Issued By EWI APP India Mumbai To raise Wildlife Awareness and its Conservation. Nature  Wildlife  Conservation  Discover ADVT Wildlife SOS was established in 1995 by a small group of individuals inspired to start a movement and make lasting change to protect and conserve India’s natural heritage, forest and wildlife wealth. Today, the organization has evolved to actively work towards protecting Indian wildlife, conserving habitat, studying biodiversity, conducting research and creating alternative and sustainable livelihoods for erstwhile poacher communities or those communities that depend on wildlife for sustenance. Vivek Menon talks about himself & wildlife, Recently Vivek Menon has been Interviewed By Explore Wild India‘s Editor Devesh Kumar. Asian lions besides 1300 bird species and an amazing landscape that spans the Himalayas to coral islands, rain forests to deserts. It is a magnificent heritage. 2. How do you see Dudhwa as a Wildlife Zone? Dudhwa has a grand history of being a wonderful wild place on our Nepal border. It was the queen of the Terai when Billy Arian Singh gifted it to the Indian state. Today it has great human pressures, but nothing that a determined administration or a good officer cannot solve. In fact I am. Spending some days in Dudhwa in a week or so. 3. GHNP or Rajaji which one you will select to Photograph Wild Animals? That depends so much on what you want to photograph. If it is wild goat or alpine birds or stunning landscapes it is GHNP; if it is elephants it is Rajaji. 5. Tell us about Your Book (Indian Mammals: A Field Guide)? The Indian Mammals book has been done twice over. I first wrote a book called the Mammals of India for Dorling Kindersley and Penguin 15 years ago which sold over 10,000 copies and was translated into two languages. Then a few years ago I redid it completely covering all the species and taking identification up to sub specific level. This I did for Dorling Kindersley. As a companion I also brought out the Secret World of Indian Mammals for children. All of this has already sold three reprints and I am now working on a Second Edition there will also be a pair of books for adults and children on the Nature Reserves of India coming out next year. Devesh Kumar is the Editor and Founder of Explore Wild India Magazine which is registered by Govt of India under RNI. He is the Wildlife Researcher too currently working on Red Panda Research Study under Explore Wild India Research Programme. ape, Western Hoolock gibbon. This species is listed as endangered species in IUCN Red list with less than 5000 individual left in wild. This is a tailless primate with long arms, hanging from high branches they feed primarily fig and other fruits, swinging through the isolated and evergreen forest canopy of northeast and some of them are also known to live in west of the Chindwin river of Myanmar. One of the largest groups around 100 individuals with 26 families lives in Hoollongapar Gibbon wildlife sanctuary, Assam. The upper canopy of the forest is dominant by the hoolong tree which is the state tree of Assam and the name â&#x20AC;&#x153;Hoollongaparâ&#x20AC;? is also come from this tree. The forest has been surrounded by the tea gardens and small villages. With the Gibbon there are 7 different species of monkeys over here, and also famous for only nocturnal primate this is Bengal slow Loris. The other primates include the Stump tailed macaque, Northern pig tailed macaque, Eastern Assamese macaque, Rhesus macaque, and caped Langur and also found at the sanctuary are Asian Elephant, tiger, wild boar, three different type of civet, four types of squirrel, several types of snakes and more than 200 species of bird. In Hoollongapar Gibbon Sanctuary there are 26 family of western Hoolock Gibbon are known to live in this forest. They spend majority of their time up in the canopy, hanging from high branches they feed primarily on fig and other fruits, they consume water from tree holes. capable of their reaching speed up to 20km/hr, covering up to 6 meters in just one swing and they are the fastest flightless animal in the canopy and they acrobats of the forest. Spotting Gibbons are never easy as they are almost entirely arboreal and comes down to the ground only in some exceptional situation. They swing from tree to tree in a mode of locomotion known as Brachiation During the mating season they have been reports of them coming down to eye level. Males and female gibbons are similar to their size but males are easily identifies by the coloration their black fur in the body and a distinctive white brow, while the females are dark brown hair on the side of their face. Females are totally different in color of their body. Gibbons are famous for their territorial call reverberate through the forest and used by individuals to attract mates. Females give birth to one offspring every 2-3 years and it remains within the family group for 8-10 years. In 2009 Gibbon was considered to be one of the 25 most endangered primates. The most threatened thing to the sanctuary is that a train track divided the forest into two different part for that the Gibbons family are also separate in two parts but after Assam Forest Department making a bridge to connect the gibbon on either side of the train track that divides the sanctuary but this technique is not working till yet. It is known from the forest guard that 3 families are lives in one side and most of them are lives in the either side. The forest guard Bikash Boruah tell us that the gibbons of the either side are seen rarely and he also tell us the big problem of the sanctuary is deficit of water for that they make some artificial pond under the forest. Day by day this beautiful creature of nature is threatened by human now a less number of them are left in the forest of Assam. Assam Government should make some strict rule for protecting this animal otherwise one day we will lose them all. - PRIYANKU CHETIAPATOR Priyanku is a - 20 years old Bachelor of Science student from Department of Botany at Sibasagar College, Joysagar, Assam. Merlin (Falco columbarius) flying in the grounds of little Rann of Kutch. We Accept payment Through Paytm and PhonePe. Note: All Logos are Copyright with their respective Companies. Buy Magazine Online or Order us by mail shop.explorewildindia@gmail .com & Paytm us at 09868648790 or PhonePe us at 8828275921. An initiative of Explore Wild India APP Media Group! 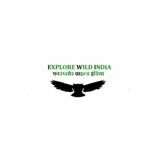 Explore Wild India APP Society Contribution Chaitanya Vihar Phase 1, Chaitanya Vihar Vrindavan, Uttar Pradesh 281121.